We’ll be hosting our next webinar on Industry 4.0 and IoT! This webinar will explore the convergence of Operational and Information technology as one of the key benefits of the Internet of Things; and how to use this convergence as a way to build a new generation of integrated digital supply chains which are the base of Industry 4.0. 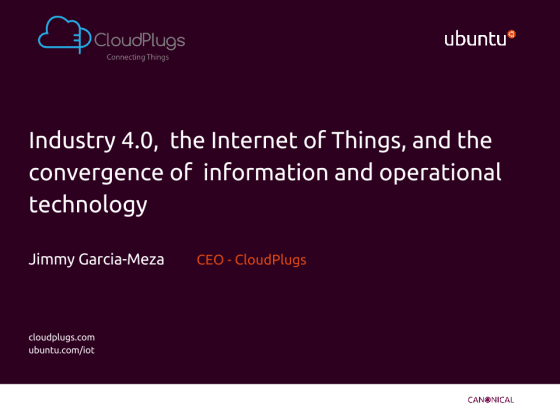 About the speaker: Jimmy Garcia-Meza is the co-founder and CEO of CloudPlugs Inc. He has over 20 years of experience running startups and large divisions in private and public U.S. multinational companies. He co-founded nubisio, Inc. a cloud storage company acquired by Bain Capital. He was CEO of FilesX, a backup software company acquired by IBM. He held various executive positions at Silicon Image (SIMG) where he was responsible for driving the world-wide adoption of HDMI. He was a venture director at Index Ventures and held several executive positions at Sun Microsystems where he has in charge of a $1.7B global line of business.